"I know sometimes that rain throws it all off," said Cody Chesnutt during his encore at SOB's last night, thanking the crowd for braving the elements to make it to the show. Believe me, no one even remembered it was pouring outside. I might not get off of work in time to see Chesnutt open for Mavis Staples at Prospect Park tonight, but if you can, make it your beeswax to get there. The evening began with a quiet set from singer-songwriter Jennah Bell. A beautiful young woman with purple braids and a nose ring, she looked more Badu than Baez, but her songs, at least when accompanied solely by her acoustic fingerpicking, definitely leaned towards folk. Her voice was honest and bright, exposing tints of twang in "Phoenix Lights" and "John Forbid." "How many of you are familiar with John Mayer?" Bell asked with absolute sincerity. "He's got this really great song called 'Slow Dancing in a Burning Room.' I'm gonna attempt not to bring shame to this song." I'm pretty sure that's the first time that's ever been said. I'm also fairly certain that her song "Red Rooster" is the only tune out there inspired by the 1991 animated film, Rock-a-Doodle. Sadly, her gentle performance was inhibited by the sonic imperfections of such an oddly shaped room. Cheers from a VIP section sounded like they were coming from a distant tunnel, and bar chatter rebounded off the tall walls. I'd like to see her again, but in a more intimate venue such as Rockwood. I also want to write a movie just so I can cast her in it. "Where legends are made" reads the screen behind the stage at SOB's. 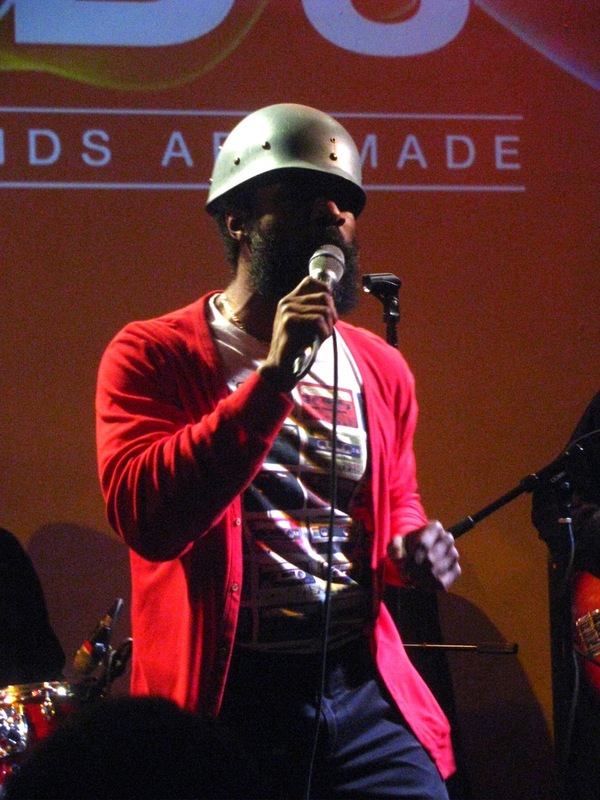 If there's any justice in the world, Cody Chesnutt will become one. Not yet a household name, when someone asks me who he is, I explain that he's the guy singing the hook on the Roots' "The Seed 2.0," which is an updated version of a song from his debut album, The Headphone Masterpiece. While I feel that record earned its moniker, it's been more than ten years since that indulgent, heavy, brilliant collection of lo-fi neo-soul, and Cody is a different man now. His follow-up disc, Landing on a Hundred, was released just last year, and it's a delightfully peppy mix of Motown and Memphis soul. As the band attacked with the opening cannonade of "That's Still Mama," Chesnutt appeared at stage left. His outfit's juxtaposition of an army helmet and a red cardigan evoked a sort of black militant Mr. Rogers, an eccentric character you'd meet in the subway. The helmet represents Cody's personal fight against his inner demons, as well as a more global struggle to keep feeling in music. He's not outwardly angry, not that he could even attempt to appear so, testifying on the joyous "'Til I Met Thee." Between lyrics, a quick confession: "Oh, I love life." The crowd was completely captivated. During "Everybody's Brother," a few fans attempted to start singing at the point Cody comes in on the record. He psyched them out and admonished, "Don't get ahead of me." He took another beat before crooning the first line, "I used to smoke crack." "Oh... my... goodness!" clamored an awestruck female in the front, not at the admission to drug use (He's actually never smoked crack in case you were wondering. ), but at Cody's honey butter voice. Marvin Gaye may have been murdered before I was born, but his spirit is alive and well inside Mr. Chesnutt. There was a smile on my face for the entire concert. "Lemme hear that skin poppin'," he requested, encouraging us to snap our fingers to the jazzy beat of "What Kind of Cool (Will We Think of Next)." "New York City is still cool," he said, grinning with approval. It pains me to think of the subtle snaps and stomps that will be lost on the large crowd at today's Celebrate Brooklyn event. In the show's centerpiece, "Love is More Than a Wedding Day," Cody admitted, "I wish I had my wife with me right now, but this microphone stand is gonna have to do," taking it for a little dance. He sang to us, "This is my favorite song on the entire album. Do you want me to tell you why?" "Yes!" we demanded. He took a seat on the wedge monitor, and explained the song's genesis as a way to reinvigorate and sustain a marriage that had gone so astray that he and his wife felt like strangers. The edge of the stage was obviously not close enough for Cody, who ventured onto the floor for "Do Better to the Young," hugging crowdmembers as he sang. Returning to the stage, he led us in a whispered chant of the chorus to "Where is All the Money Going," letting us know that "even in a whisper, you've still got power." Chesnutt finished with "Don't Wanna Go the Other Way," taking the time to shake hands and fist-bump everyone in the first two rows as he exited. The sound tech got on the PA mic and initiated a cheer of "We want more!" Two minutes later, Cody and band acknowledged the plea and revisited the stage. "Once again, we're gonna need your participation. Are you ready to participate?" Cody questioned. Roars. The band ignited "I've Been Life," and Cody sanctioned the audience to repeat the line, "Since my birth, I've been the greatest attraction on the earth." If sung alone, it would reek of the hubris found on Headphone Masterpiece, but done as a crowd, it served as an empowering statement of self-worth. The melody just begged for a segue into "The Seed," but Cody let it beg. Chesnutt only reached as far back as 2010's Black Skin No Value EP, which I suppose would be my only criticism of the superlative show. While some of the sexually graphic or dark material on Headphone might seem at odds with the positivity of the new tunes, there are definitely a few like "When I Find Time" or "Up in the Treehouse" that would fit right in. "I truly hope you enjoyed yourself this evening. Did you feel something? We're trying to keep that feeling in music," Chesnutt proclaimed. You're doing an excellent job of it, Cody. I only hope I can leave my job at a normal hour, so I can feel it again tonight.